This important landmark in the Village of Hamburg was dedicated on July 1836. The Baptist religious denomination is important to Hamburg history as the 1962 Hamburg Sesquicentennial book noted, "to the Baptist denomination goes the honor of having the first regularly organized church in Hamburg." Baptists have gathered in Hamburg since 1805 when they met informally in homes with itinerant preachers. First pastor, 1810 to 1819, was Rev. Clark Carr from New England. He was given a log house near Ezekiel Smith's home and in 1814 he acquired a farm near the present church on Main Street. Pastor Joshua Newton took his family and other families to Aurora for safety after the British burned Buffalo during the War of 1812. In February 1834, plans were made for a new house of worship. Baptist Trustees, including Thomas Fish, bought a half-acre of land was from Moses Clark. In November 1836, Pastor Rev. David Searles was given a "salary of $400 and firewood." In 1855, a new bell was hung in the steeple, to call people for worship and to be used as a fire alarm. In 1876, the parsonage was built and in 1885 the congregation installed a hand-pumped organ for worship. Remodeling was done in 1885 and 1893 as the congregation grew. A major renovation took place in 1921, but the overall appearance of the original wooden church was maintained, unlike many Hamburg village churches that replaced wooden structures with new brick churches before the Great Depression. Besides its historic value, this church and parsonage are important for architectural reasons. 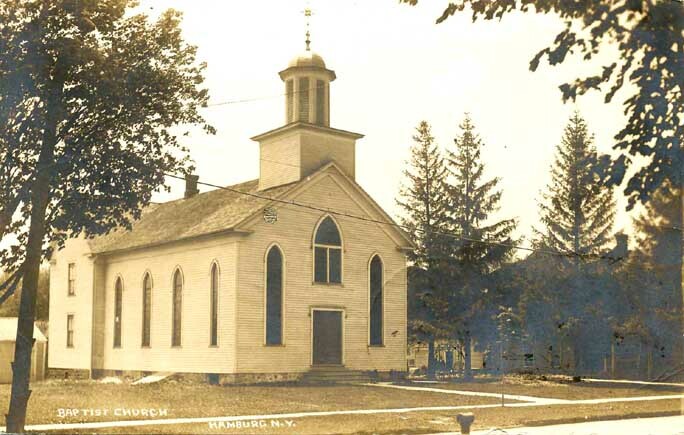 Built in the 1830s, the First Baptist Church is one of the oldest surviving structures in the Village of Hamburg. It is the oldest church building in Hamburg, surviving on its original site for nearly 180 years. There are many aesthetic factors that contribute to the value of this church. Its simple style has pleasing proportions and a beautiful small scale. Its roofline has two attractive lines and an elegant steeple with an attractive bell tower with a bell from 1855. The east and west walls have four stained glass windows in tall and narrow shapes with simple Gothic points on top. These shapes are repeated in the three stained glass windows on the front façade of the church. The stained glass windows have inscriptions about their donors, people from Hamburg's past. The remodeled front entrance continues the early style of the original building and includes four columns flanking the main door. The church has been enlarged several times and the original painted wood skin has been covered with siding. This does not contribute to its historical value, but could be removed for greater authenticity. We do not have a similar church building in the Village of Hamburg. This building is prominently featured on the new sign, "Hamburg Historic Walk" recently installed by the NYD DOT Route 62 project. F (footprint) The Sanborn Insurance Maps of 1885 and 1902 show the Church has been located on this same place of Hamburg's Main Street all its life. The footprint has expanded through the church's growth, but the original footprint has been respected. R (roofline) The basic roofline has been preserved with later additions such as the front entrance repeat the angles of the original roof. The attractive steeple and bell tower add a great deal of interest to the overall rooflines of Main Street. E (envelope) The overall scale and shape of the church contribute to the environment. S (skin) The modern siding is a negative, but could be removed. The siding is not entirely obtrusive as it conforms with the original woodwork. H (holes) The eleven stained glass windows are attractive "holes" in the building and the contrast with the white exterior of the building. The setting of the Church and the Parsonage are important for the Village of Hamburg. The Church is now the building closest to the intersection of Main and Center Streets on the southeast corner. In the past, the J. R. Rittman Carriage Works stood on that corner. Since the new Roundabout was constructed at this intersection, this location is extremely important for a public building that contributes to the quality of life in Hamburg. This setting showcases this attractive, historic building that has many positive qualities as a community cornerstone. Other communities would envy this picturesque feature. The language of Historic Preservation would call the First Baptist Church "contributing" as it has an architectural presence and features that add to the streetscape and quality of life in the community. Contrast the First Baptist Church with the gas station across Main Street for an example of a "non-contributing" building nearby. Church buildings are extremely important to a community and worthy of preservation and creative reuse if a congregation moves away. Churches had central locations in communities and were frequently built on important sites. They are important to religious people as places of worship, but useful for the entire community in many ways, for example, a church bell would toll the hours. Churches are symbols of things that people value and it is important to keep these symbols in a community. Many churches are being sold throughout Western New York nowadays and they are being used for a wide variety of purposes. Many small but growing congregations are purchasing old churches and Hamburg certainly has a wide variety of small religious denominations that have moved to our village. Two WNY church buildings have been sold to Buddhists, and two churches are expected to be purchased by the Polish Catholic denomination. One church was purchased to house a Religious Art Center and one in the south towns has been adapted as a Bed and Breakfast art center. Creative reuse honors the original purpose of a building and brings fresh life to the community.